Rory McIlroy missed the cut at the Honda Classic for the second year running as Rickie Fowler carded another 66 to lead by one shot. 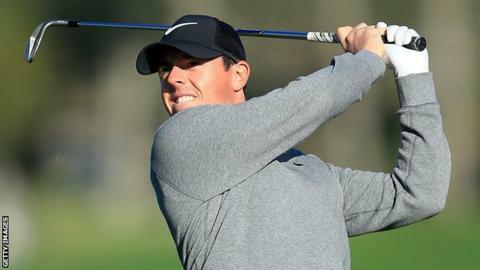 World number three McIlroy, 26, carded a two-over-par 72 to miss out by one stroke at the PGA National in Florida. The Northern Irishman had a triple bogey on the fifth and a double bogey on the 15th to go with four birdies. Fowler's four-under round took him to eight under, one shot ahead of fellow American Jimmy Walker. World number five Fowler, 27, shot four birdies and no bogeys for the second day in succession, although he was fortunate to escape with a wild drive on the first, his 10th hole of the day. "I got a nice break on one but kept myself in it with some good up and downs, made some good putts and it was a little bit of a bonus with a birdie on the last," Fowler told PGA Tour Radio. "I'm definitely pleased with the way I've played the last two days." Overnight joint leader Sergio Garcia had three birdies and two bogeys in a 69 to lie six under, a shot ahead of Australian Adam Scott, who carded an impressive 65. Defending champion Padraig Harrington recovered from playing his first two holes in three over par to card a 68 and finish one over par, with fellow Irishman Shane Lowry a shot behind after adding a 75 to his opening 67.